I am not giving elementary school teachers a hard time; I am an educator myself, though the older student is my area. I know that one teacher (who is lucky if she has a full time aid or a steady stream of classroom volunteers) of fifteen to thirty children has a lot on their plate. I went to my daughter’s kindergarten orientation and I saw no behavior charts on the walls, only a job wall and other community and self-help types of things. I was so happy to report that it wasn’t there! When I went to open house two weeks later, my heart sank a bit when I saw the chart. It was quite small and inconspicuous with only four levels, but still it was what it was. When I was a kid having your name put on the blackboard was a big deal. This is the same thing only with a rainbow rather than blackboard and white chalk, or green board and yellow chalk. If your name was on the board for an infraction you either sank to the bottom of your chair feeling horrible and hoping it didn’t get back to your parents (you never remembered what you did) or you strutted around proudly having been designated the class troublemaker (and you took that job seriously if that’s the role you were expected to fulfill). If, on the other hand, you got your name on the board for praise, in the 70s and 80s that pretty much made you a target if you weren’t popular. When I went to school you were either good or bad, and when my much younger siblings went to elementary school. Everybody was good because they breathed. The outcome wasn’t great for either of our generation’s elementary school years. In some schools things have changed and in others, not so much. The behavior chart is never going to work. It only gives the illusion of order, and it does very little to change anything. It can escalate out of proportion, too, with the wrong kid on the wrong day. Public praise for expected behavior is still going to back fire as it always does. The public stocks of the classroom. The gap will grow wide for the “haves” and “have nots” of the classroom (as it has always done). Even with the new notion of starting fresh every day will always give that “sinking feeling kid” a stress stomachache and the “don’t care what you think” kid no reason to change. It doesn’t matter if the words now say “slow down” “think” “parental contact” or “teacher’s choice.” They are still threats. Rainbow coated threats. Sugar-coated with sparkles. It doesn’t matter if the top of the chart says, “awesome choices” or “super star” or “great job”. They are still praise for expected behavior (praise junkies are made in such ways). And for the record, acknowledgement is different than praise. There are strong studies that support the fact that praise for expected behavior does not create harder workers and is not that much different than punishments as far as control and not fostering internal motivation. People who are always praised, work with less effort than those who aren’t and are more likely to not undertake a task if they think they will fail. It is external motivation vs. internal motivation. The latter has more staying power because the reward isn’t the driving force. You can’t even bribe high school students with money in exchange for grades and behavior; pay for grades programs make very negligible impacts. I’d like to see these charts go away entirely, but I also understand that the teachers may be required to use them (the almighty “they” are always a little slow to catch up to what a lot of teachers already know). Is there a way that we can change the charts a bit more until they can be just removed completely? Something more community interactive and self-aware, rather than threats and praise? 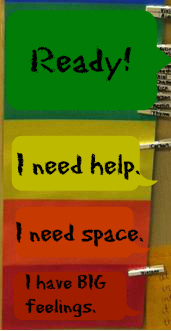 What if, instead of the chart being about pointing out “bad behavior”, how about a visual communication tool that allowed the teacher to know who was ready to go forth on their own, who needed help, who needed space to process, and who was having a rather rough (or monkey) day. Just because you are five or six, doesn’t mean you aren’t having a bad day that just seems to be imploding on you. What if the chart was merely a visual representation of what the kids are having a hard time verbalizing, and a cue for those children who have a hard time recognizing body language? 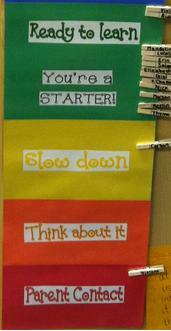 What if the chart could also let the other students know what was going on in their classroom community. If someone needs help, does it always have to be a teacher, maybe it is something a friend could do, or the whole class together. What if the children knew who needed space and knew to give them a little extra breathing room? And big feelings don’t always have to be negative ones. Maybe someone is just really excited or anticipating something and just can’t keep in the fidgets or outbursts. It would be nice if everyone new that. So here is what I propose to change these current chart trends if you are in a position where your job requires that they be used. If they can’t be taken out, why not changed? It will be the children, not the teacher who move their pegs when they come in to start their day and they can change it if their status changes. Maybe someone will always be in the neutral zone…their choice. It won’t be something done TO them. It will be something they DO for THEMSELVES so that communication is open, the teacher can inquire as to the nature of the issue, and their class community can be in the loop. It is about how THEY are feeling and not what they will get (reward) or what awaits them (punishment). And best of all, no one has to feel like they are on public display. I like this. I think it is a very Fred Rogers sort of attitude toward helping children realize their feelings are important and can be dealt with, and it doesn’t necessarily make them bad or good. Ooh, I really liked this post as you make a lot of sense. I especially love your disdain for “praise for expected behavior” and your reasoning that it “is still going to back fire as it always does. ” I agree strongly with this and that it doesn’t do kids any favors. Thanks! I have never like behavior charts. People tend to forget that a legitimate option is for the individual to not care about the chart and ignore it! You might like to read books written by Alfie Kohn, I bet your local library has copies. He explains more clearly The psychology. Like how if we are aiming for a reward (instead of being internally motivated) we take the shortest path to it,we don’t waste time to exploring options, creating, or taking risks. Oh cool, thanks for the author recommendation. This entry was posted on September 30, 2015 by Laissez Faire in Article, attachment parenting, kids, life, musings, parenting, society and tagged alfie kohn, behavior charts, classroom management, internal motivation, Kindergarten, parenting, punishments, rewards, school, teaching children.